This one is Just 4 Fun! I love this beautiful dsp from Stampin' Up! It's retired but see how even after a dsp is retired you can STILL find uses for scraps! 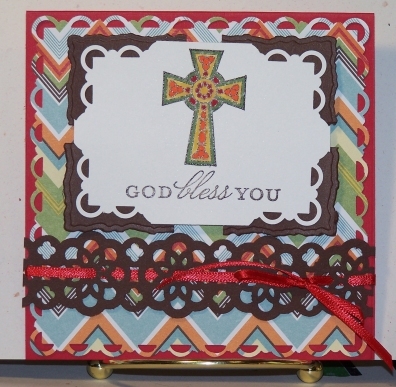 I love coming across these little bits and pieces in my stash and using them again and again to make some beautiful cards. The punches are SU Scallop Trim Corner & Border and I also worked the NEW beautiful Lace Ribbon Border punch into the mix. The stamps are SU Crosses of Hope. I hope you enjoyed looking. If you did, please let me know with your comments.